LabProof SE | SCREEN Graphic Solutions Co., Ltd. Evaluation of color measurement results ensures high color proofing accuracy at all times [Option]LabProof Certify measures the color in proofs after output and determines whether the proof color meets the target color standards. Clients get assurance for each proof sheet, so they can be confident they are receiving consistently high-quality color proofs. ・Depending on the type of printer used, it's possible to set up the automated system so that colors are measured automatically by the spectrophotometer loaded on the printer during the process on printing, and the evaluation results are output onto the proof. 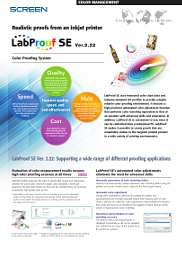 LabProof SE automatically creates optimized color matching tables using ICC profiles and scans of color charts output by the final output device. During color adjustment, LabProof SE controls the printer and spectrophotometer through repeated output and measurement of color charts. LabProof SE optimizes color reproduction automatically and ensures that colors are as close as possible to the targeted printed product, which results in high-precision color matching. The level of color matching precision is displayed numerically as ΔE, so the operator can confirm the accuracy of the output from the printer at a glance. More realistic reproduction of spot colorsOptimized reproduction of spot colors is now possible simply by selecting the appropriate swatches for DIC or Pantone colors. When printing spot colors, peripheral colors with higher or lower levels of red, blue, yellow or other colors can be output as variations. 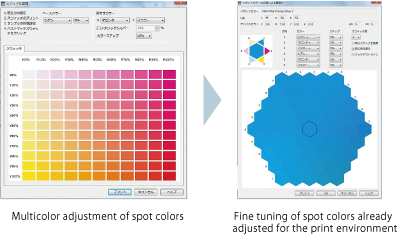 If a more suitable color is selected from among these variations, the accuracy of color matching can be further improved. Spectrophotometers that are internal to printers (internal spectrophotometers) cannot measure offset printed products.